We often have Dalmatians who will need foster care. We have Dalmatians who’s owners have suddenly died or friends or neighbours who have inherited a dog from his or her original family and know very little about them. If we don’t have a clear picture of a dog or if we are unsure of his or her history then we will try and place these dogs in Foster care in order to get a better picture of the dogs true nature and behaviour. We have a network of Foster carers across the the UK. Each year we loose our fosterers as they succumb to the delights of their fostered Dalmatians and decide to become adopters themselves. Do you think you could become one of our Fosterers? Many of on the committee regularly foster Dalmatians and despite it being heartbreaking to let each one go, we know that there will be another dog needing our help just around the corner. 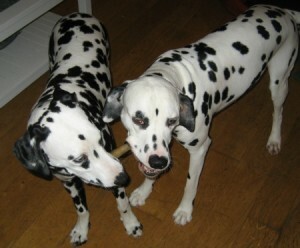 If you already own a Dalmatian and they are good with other dogs we can still Foster a dog with you. We do ask that you undergo an assessment (as our adopters would) and of course if you do fall for your charge and decide adopt all the checks have already been done! If you feel that you could help us and you would like to know more about fostering for British Dalmatian Welfare please contact us via the website and we will be in touch.